A costume for every day of the week! Homecoming dress up days are more than just the opportunity to don some untraditional garb - they also promise endless fun and memories sure to last a lifetime. Homecoming week is one of the most exciting periods in a high school student's life. It embodies the enthusiasm, spirit and tradition that bind the entire school community together, and it's a way to build new memories while taking inspiration from the old. The big football game is the highlight of the week, drawing parents, alumni, teachers and local community members to the school in support of their team. Clearly, it's not only the students who feel the excitement during homecoming week! Parade: Nothing builds morale and spirit like a parade! The entire community may come out to watch, but the stars of the show are the students. The marching band, school organizations, student clubs and homecoming court are all presented with great pomp. 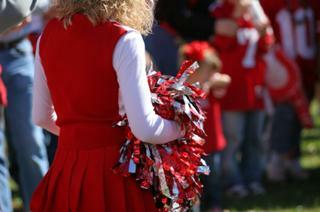 Pep Rally: Some schools might hold a pep rally in addition to - or in lieu of - a parade. The pep rally is an opportunity for the football team to introduced, the cheerleaders to spur the student body on and the students to encourage the team. Dance: The homecoming dance is almost always a night to remember. Students go all out on this enchanting evening, renting tuxes and limousines, purchasing gorgeous dresses, exchanging flowers, making big plans and dancing the night away. Dress Up Days: Perhaps the most appealing part of homecoming week is its ability to transform even the least likely students into the most spirited, enthusiastic people on campus. Dress up days are designed to do just that. On these days, students are encouraged to dress up in a manner that suits the selected theme for the day. Forget about being a wallflower. On homecoming dress up days, absolutely anything goes. The daily themes are typically playful, youthful and meant to build on the already buoyant mood of the school community. They are also silly, fun and likely to incite plenty of laughter! Toga Day: On toga day, expect to wander the halls amongst young Greek gods and goddesses. All you really need is a decently sized cloth or sheet, a belt and gladiator sandals to complete the look! Dramatize the quintessential woman of the '50s with an outfit that would make June Cleaver proud. A full-skirted dress boasting a broad Peter Pan collar should do the trick. Pull a Jackie O for your '60s costume with a boxy jacket, a pillbox hat and a straight skirt. It's time to pull out the platforms for '70s day - the chunkier, the better. Guys might pair them with some crazy bellbottoms and a high turtleneck for a J.J. Walker-esque look, while gals can easily throw on a brightly colored mini-dress and look the part. There's nothing like big hair, blue eye shadow and a tie-dyed t-shirt to scream '80s fashion! Don't forget your jelly shoes. Today's teens likely won't have an expired grunge wardrobe to resurrect for '90s week, but they can make do with a flannel shirt and baggy jeans. Bling Day: Pretend you're headed to the Oscars - by donning the chintziest, goofiest gold jewelry you can get your hands on. Stores like Claire's Boutique and The Icing are ideal choices for scooping up cheap gold bling. Hawaiian Shirt Day: If only every school day were so relaxing. At least you can pretend it's a breeze on Hawaiian shirt day. School Colors Day: This is by far the most anticipated dress up day of the week, because students can adorn themselves as wildly as they wish in their support for the school. It's not unusual to spot painted faces, colored hair and tattooed arms and legs, usually emblazoned with the school colors.